A mining rig lost in deep space. Cryotubes hijacked by organ traffickers. This will be a rough ride to reach the escape pods. 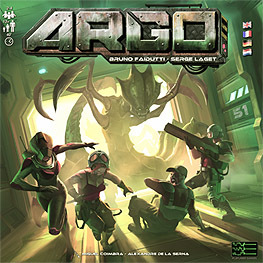 Argo is a team effort by acclaimed authors Serge Laget (Mare Nostrum, Ad Astra) and Bruno Faidutti (Mascarade, Citadels). Kill the other humans using the Aliens as you race to the escape pods but be careful, as if too many are lost the Aliens prevail and no-one wins! You must strike a careful balance between competition and coopertion to win this game, as the seats in the escape pods are limited. Your team special abilities and the room effects in the mining station Argo will provide a decisive advantage if you can use them efficiently.